A model of polarization of parallel light propagating in ether is proposed: in certain directions of planes, the phase of all the wave trains are the same at any time, and their effect are additive, while only mean values are observed in the other directions. This occurs when natural light is reflected at the Brewster’s angle or by passage through crystals such Iceland spar. For light polarized in the incidence plane or in the perpendicular plane, the formulae obtained with longitudinal vibrations are the same as the Fresnel’s ones, with transversal ones, by replacing the electric induction by the displacement vector. A model of longitudinal vibrations propagating in ether-like medium can account for polarization of light : parallel light would be polarized in a plane when all the trains of waves propagating in this plane have the same phase at any time. 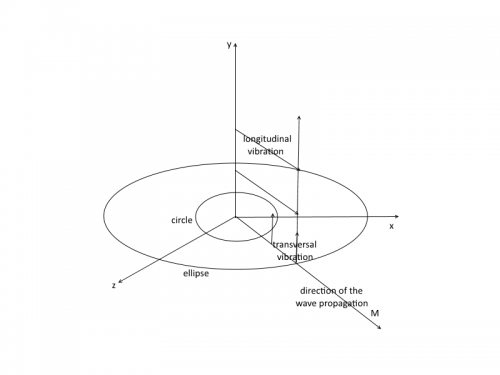 The relationships obtained in this way are similar to those of Fresnel, with the amplitude of the longitudinal vibration replacing that of the electric induction vector. The light polarized in the plane of incidence can be compared to a sound wave. In anisotropic media such as crystals, light separates into two rays which correspond to a longitudinal vibration and to a transversal one. In transparent media, there would be a delay between the wave reception and its reemission by an atom, corresponding to the reorganization of the orbitals, and the speed of light would be smaller than in vacuum. This model of ether in which light propagates would be constituted of corpuscles several orders smaller than the elementary material particles and moving with the speed of light. It is consistent with the stellar aberration, if it is assumed that the material particles reemit isotropically the energy received from the corpuscles of ether. This assumption leads to the independence of the rate of light from the rate of the medium in which it moves, which is the fundamental hypothesis of the Restricted Relativity.